Yesterday was totally my binge day. OMG, score! I’ve decided to allow myself one binge day a month, mostly because I am so good all the time. I don’t eat this, I don’t drink that and I train/exercise every single day. So I rightfully deserve a binge day once in a while. A much deserved reward. For the record, my binge day is not really how normal folks would define a binge day. There’s no stuffing my mouth with processed food, fried food, sugary drinks or anything of the sort. All my friends say that my binging day is the lamest thing ever. That I’m not even binging. I’m just pretending to binge while still eating healthy food. To me binging is only about enjoying food I don’t usually eat. I would never binge on BigMac, Pringles, KFC, etc. I find no pleasure whatsoever in eating these foods; it would be pure torture. Mindless, thoughtless eating doesn’t really work out for me. The act of just shoveling something in, without any thought, it’s just not me. Period. Okay...now that I’m thinking about it, my friends might be a tiny bit right. I’ll concede them that. I don’t think I really have “binges”; my binge days are just days where I just decide to eat stuff I like - and I don’t usually eat - without giving too much of a thought. And things I like, in my world, are generally healthy. It all balances out in the end for me. On this great “binge day” (and I’m not using the quotes loosely here), I enjoyed a great avocado toast with spicy eggs for brunch at The Fat Radish, I went to Grom to get a badass raspberry sherbet, then I got home and I made myself the greatest crumb bars ever. This recipe comes from my granny’s cookbook, and it’s foolproof. I tweaked it a bit to include some healthier choices but besides that I stayed true to the original. 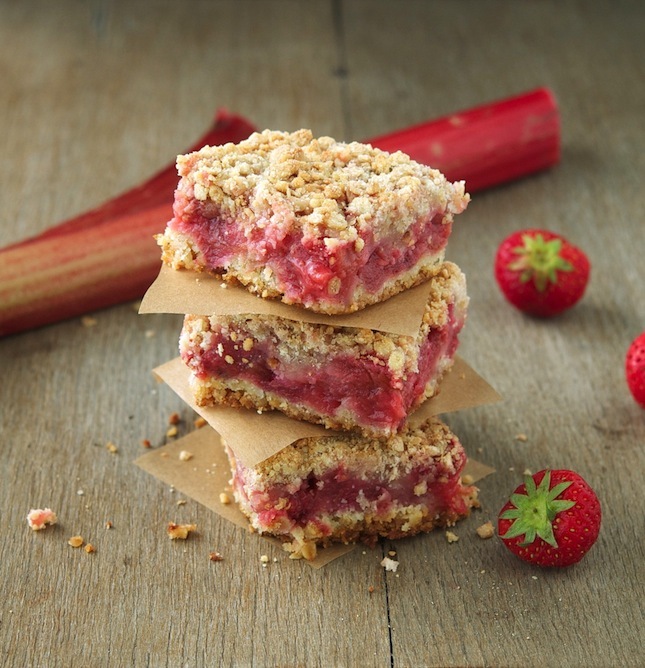 It’s packed with rhubarb, strawberries, oatmeal and other wholesome ingredients. Paleo? No. Vegan? No. Healthy? Yeah. Good? Hell yeah! I used rhubarb - an underrated fruit, which I think is a dream ingredient - and strawberries, but you might as well try other combos. Raspberries + rhubarb is also super yummy. So is blueberries + raspberries. 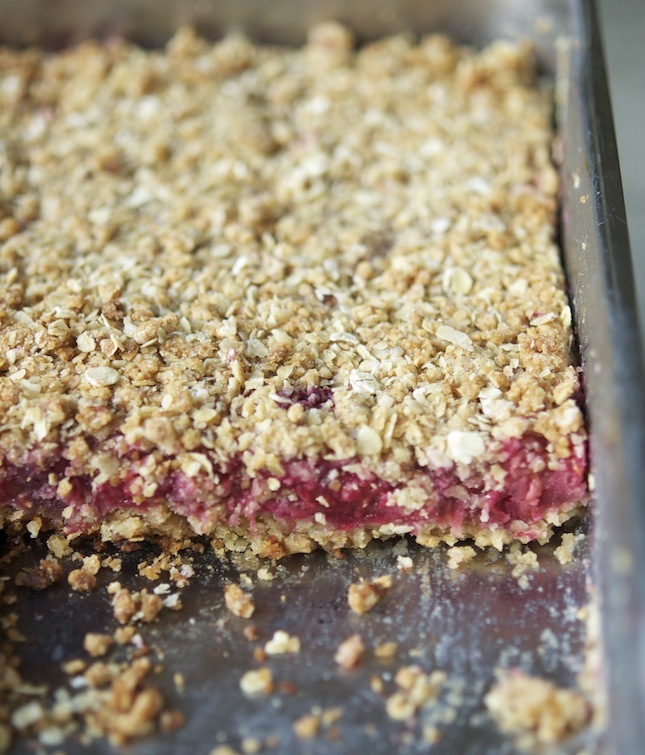 There are endless combinations for making these great crumb bars. Pick the one you think works best. Making them is super easy and doesn’t require any particular baking skill. 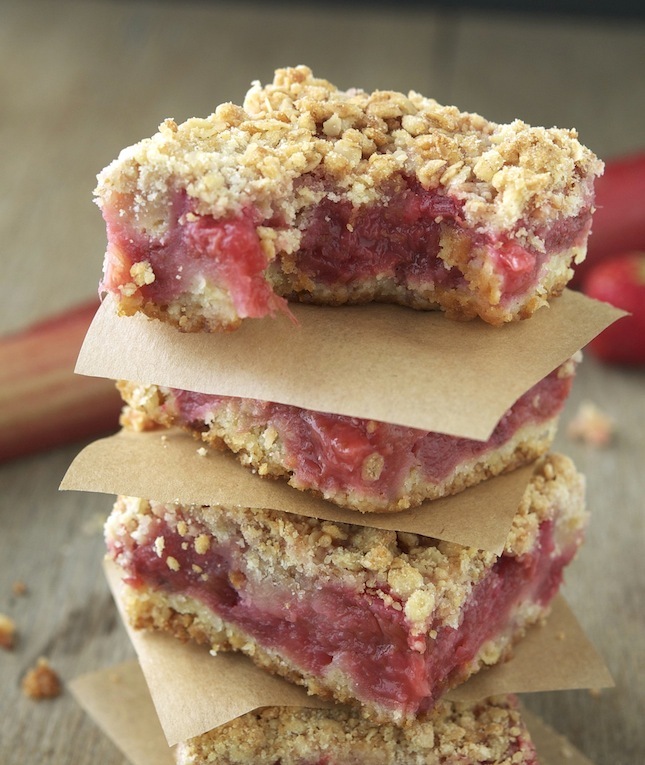 Whole Wheat Rhubarb Strawberry Crumb Bars Print this recipe! Preheat oven to 375°F (180°C) and place a rack in the middle. Lightly butter a 9x13-inch baking dish. Set aside. In a medium bowl mix lemon juice, vanilla, ¼ cup of brown sugar and arrowroot powder (or cornstarch). Gently mix in the rhubarb and strawberries. Set aside. In a large bowl, mix together 1 cup whole wheat flour, ¾ cup rolled oats, ½ cup brown sugar, baking powder and salt. Stir in the lemon zest. Add butter and eggs and work the mixture until a dough forms (it should be quite dense and moist). Pat 2/3 of the dough into the prepared pan in an even layer. Spoon the filling in an even layer over the patted down dough. Add to the remaining ⅓ of the dough, ½ cup of rolled oats and ½ cup of whole wheat flour and work them into the mixture using your hands (or a pastry cutter) until you end up with crumbly, pebbly dough (if not add more rolled oats until you get it). Sprinkle the crumble mixture evenly over the filling. Bake for 45 to 50 minutes or until the crumb layer is golden brown. Let cool before slicing with a sharp knife (refrigerate overnight for best results). One bar yields 120 calories, 5.3 grams of fat, 21.5 grams of carbs and 2.4 grams of protein. Fantastic. Your pictures are amazing! That's it. I officially hate you! And I'm never talking to you again. Say, if you were to put one in your back pocket and jog all the way to here, do you think it would still be edible by the time you got here? 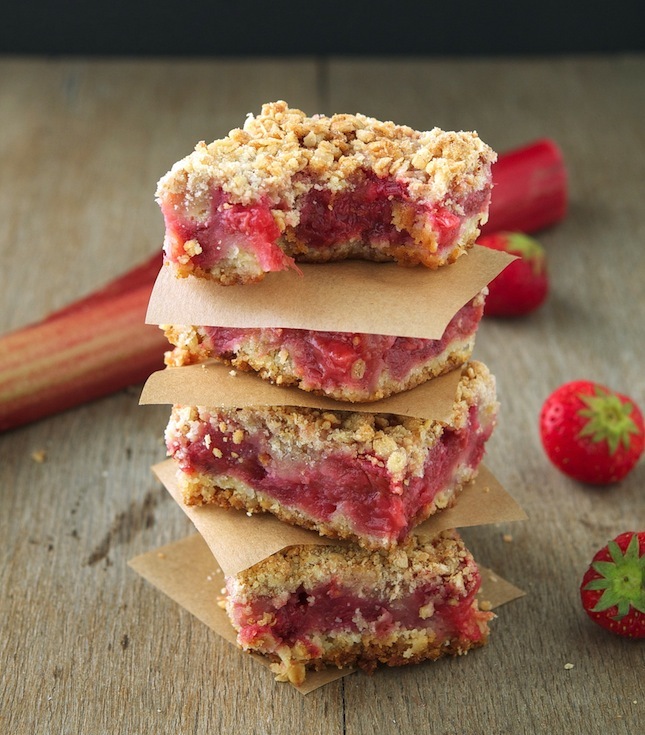 Très appétissant ces rhubarb strawberry crumb bars. Un petit bonjour de France. Thanks Chrystel, it's so awesome that you're from France. And I love your blog, it's full of yummy recipes! Oh I haven't had a strawberry rhubarb crumb since I left Maine 8 years ago. 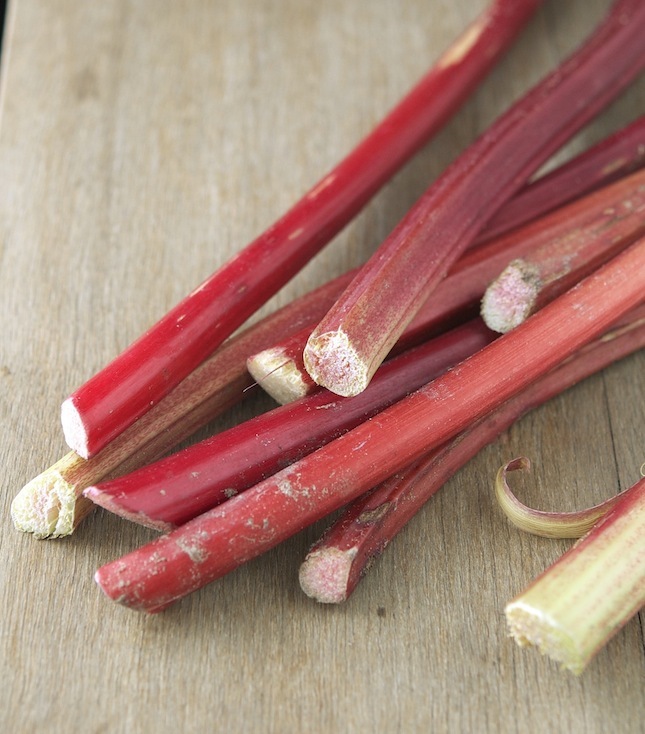 Wish I could find rhubarb here in sc.